You are currently browsing articles tagged Holy Bible. Joseph Addison Alexander, third son of the Rev. Archibald and Janetta (Waddel) Alexander, was born in Philadelphia on 24 April 1809. His early education was obtained under the immediate supervision of his parents, and owing to an intellectual vigor rare indeed, his powers of acquiring knowledge were amazing, especially in the department of languages. In 1825 he graduated at the College of New Jersey (since 1896, Princeton University), with the highest honors of his class. He was elected Tutor, but declined the appointment, and, with Mr. Patton, founded Edgehill School at Princeton. He studied theology at home and at the University of Halle and Berlin, in Europe. He was licensed and ordained by the Presbytery of New Brunswick in 1832, and became assistant instructor of the Hebrew and Greek text of the Bible, in the Princeton Theological Seminary; in 1835 he was appointed Associate Professor, and in 1840 sole Professor of Biblical and Oriental Literature; in 1851 he was transferred to the chair of Biblical and Ecclesiastical History; and in 1859, at his own request, he was assigned the department of Hellenistic Greek and New Testament Literature. The main business of his life was with the Holy Bible, giving to theological research and instruction all the energies of his massive intellect. Dr. Alexander’s gigantic mind was in full vigor until the day before his death. On the morning of that day he was occupied with his usual course of polyglot reading in the Bible, being accustomed to read the Scriptures in some six different languages, as part of his daily devotions. He seems also to have entertained himself, during some part of the day, with one of the Greek classics, Herodotus, as a pencil mark on the margin, “January 27th, 1860.” is said to show. In the afternoon of that day, he rode out in the open air for the first time since his attack of hemorrhage. During that ride, however, which was not continued more than forty-five minutes, a sudden sinking of life came on him, so much so that he was borne almost entirely by the help of others from the carriage. The sinking continued all Friday night, and on Saturday he was hardly conscious of anything until he died. His death was perfectly calm, without a struggle, without one heaving breath. His death occurred in his study, January 28th, 1860. Dr. Alexander’s sermons were sure to be original, evangelical, forcible, elegant and tending to practical effect upon the conscience. He was a frequent contributor to The Princeton Review, and for a time served with Professor Dod as its editor. As an author he took high rank. A volume of his fragmentary “Notes on New Testament Literature and Ecclesiastical History” was posthumously published in 1861. In 1851 his “Psalms Translated and Explained” appeared in three volumes. In 1857 “The Acts of the Apostles Explained,” in two volumes. In 1858 “The Gospel, According to Mark, Explained,” in one volume. the Commentary on Matthew was unfinished at his death, but so much as he had prepared was published in 1861, as the last work on which his pen was engaged. Words to Live By: A man of great gifts, Dr. Alexander was well used of the Lord in the advancement of His kingdom. Yet for all this, we must not covet. The Lord has a place and a role for each of His children, and it is not unusual to find that “the least of these” are often enabled to bear great witness to the glory of God in the Gospel. 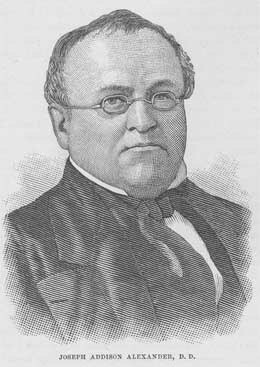 Biographical sketch and portrait image from Nevin’s Encyclopedia of the Presbyterian Church (1884), pp. 21-22. 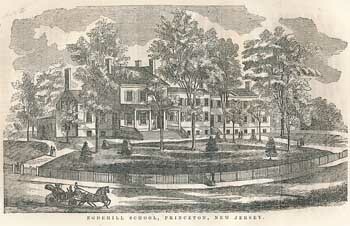 Image of the Edgehill campus from The Presbyterian Historical Almanac and Annual Remembrancer of the Church, for 1861 (Philadelphia: Joseph M. Wilson), page 341. All scans performed by the staff of the PCA Historical Center.